THE SLEEVE of a seminal early-1970s 12″ vinyl jested that its contents could not ‘be played on old tin boxes, no matter what they are fitted with’ – maybe a prophetic warning to a quick-grab, smartphone-to-the-ear generation to come. But such wisdom was recalled when soaking up this second release, as leader, from British drummer and composer Ollie Howell. Self-Identity follows 2013 debut album Sutures and Stitches, and the intervening years have seen Howell’s career flourish, with the great Quincy Jones’ “360-degree beautiful young cat” compliment leading to him selecting the drummer for the opening residency, this year, at his Q’s jazz club in the luxurious Palazzo Versace Dubai. Expanded to a sextet, with the addition of guitarist Ant Law, this line-up is completed by tenor saxophonist Duncan Eagles, trumpeter Henry Spencer, pianist Matt Robinson, double bassist Max Luthert; and ‘old tin boxes’ are definitely out, because what is striking – both about Howell’s arrangements and this Real World Studios recording – is the rhythmic sonority which he, Robinson and Luthert achieve. So, spanning some seventy minutes, the consistent appeal of these twelve original numbers is not so much the tuneful hook, but rather the slickness of the groove and the ensemble’s overarching synergy which provides fertile ground for confident, melodic soloing – and an especially tight link-up between tenor and trumpet. Syncopated, leaping figures in Shadows typify the approach as unison piano bass and double bass riffs are driven by Howell’s exacting, versicoloured lead; and the album’s pervading optimism is continued with the bright sax-and-trumpet lines of Resurge. Echoic electronics play their part, too, transitorily segueing the usual broadness of the writing, as well as enhancing the ‘timeslip’ intro to ruminative, brushed Almost Tomorrow. Rise and Fall‘s central vibrancy rocks to Eagles’ deep tenor improv and Law’s fretboard agility, whilst the rhythmic prominence of pianist Matt Robinson in Moving On and Knew is impressive. Howell’s compositions are roomy, so not only do their ‘passing clouds’ of ideas have the effect of shedding fluctuating light on their progression, they also encourage freedom of individual expression. Balancing Stones‘ dynamic range illustrates this well (including delicate timbres from the leader’s kit), as does The Unknown with its dual-horn assertiveness; and Coming Home‘s subtle, opening blend of folk/hymn tune and Balkan-imbued percussion provides the springboard for breezy, closing showcases from Howell’s players. Eschew the tinny headphones or portable speakers… and find a way to bask in the rewarding ‘hi fidelity’ of Self-Identity. Released on 14 April 2017 and available as CD or digital download from Bandcamp, and at iTunes. THE TRICHOTOMOUS CHARACTERISTICS of this established Australian piano trio are defined as captivating melody, rhythmic interplay and emotive collective improvisation. That’s a pretty challenging set of values to live up to, yet pianist Sean Foran, bassist Samuel Vincent and drummer John Parker are master explorers of this traditional and particularly exposed of instrumental line-ups. Indeed, Trichotomy’s fifth album Known-Unknown (following 2013’s more widely collaborative Fact Finding Mission) is anything but a walk in the park. Having been together some eighteen years, they’ve rubbed stylistic shoulders with Avishai Cohen, Phronesis, E.S.T. and a raft of other contemporary bands seeking a musically democratic outlook – but any similarity which might have been considered the ‘elephant in the room’ is politely ushered out of the large side door. Why? Because Foran, Vincent and Parker possess the empathy and desire to keep forging their own identity; and any momentary flickers of the aforementioned (coincidental or otherwise, and often involving judicious electronics) simply raise a smile of acknowledgement and appreciation. Ten original numbers (the majority written by pianist Foran) are predominantly vigorous, fiery, restless; and, crucially, their pressing momentum and chameleonic interest suggest an ongoing free-spiritedness which keeps these fifty-five minutes alive. Five fulfils all of that with an eager, breezy demeanour, its tensive pauses and melodic freedom easily redolent of Esbjörn Svensson, whilst the molten, repeating piano figures of John Parker’s Cells dissolve to create echoic, electronically enhanced pools of piano and percussion; and edgy, subtly dissonant Junk has grooving jazz at it heart. Rhythmically, Trichotomy are magnificent – Imaginary Limits‘ crisp dance groove fizzes to Parker’s percussion, though its irresistible appeal is undeniably down to all three (Foran’s distorted piano improvisations a delight); and the clattering, push-pull impatience of Asset or Liability feels gloriously anarchic. The trio’s more calmative moments are no less inviting, partly due to their pervading uneasiness. Samuel Vincent’s softly-malleted, arco-bass Past Tense broods darkly; John Parker’s countrified, fireside folksong, It’s Strange Coming Back, seems quietly anguished. And that same ominousness from the drummer’s pen bursts into the urgent, prepared piano and Fender Rhodes groove of Reverie of Lack – this has alarming drama/thriller written all over it. Foran’s complex piano figure sets up panicky, irascible rock in Semi-Quasars; and levitational Hemmingway closes with snappy though sunnier rhythms enfolding its dreamy central section. Released in February 2017. Available from Challenge Records, as well as Amazon, iTunes (and at Bandcamp, with a four-track EP alongside). SLOVENIA to NEW YORK… a personal narrative of immigration and acculturation. Drummer, composer and bandleader Jean John’s ambitious work The Port of Life – dedicated to all the immigrants of this world – fulfils his belief that music should always tell a story and create an experience. Born Žan Tetičkovič, in Ptuj in Slovenia, Jean John relocated to the United States in 2010 to further his artistic ambitions, and desired to communicate the “whirl of emotions in trying to find and establish the existence in a new culture”. SLOWLY ROLLING CAMERA’s eponymous 2014 debut release made a strong impression, garnering an enthusiastic, international fanbase – and follow-up All Things powers to still greater heights with its dynamic blend of soul, electronica, trip hop, jazz and rock. Fronted by charismatic vocalist, vocal arranger and lyricist Dionne Bennett – whose deep, emotional timbres are the band’s signature – the central quartet completed by Dave Stapleton (keyboards), Deri Roberts (sound design, electronics, percussion) and Elliot Bennett (drums, percussion) calls upon an impressive complement of musicians to assist in realising their ambitious, lush, almost rock-symphonic imaginings. Echoes of The Cinematic Orchestra are authenticated by the presence of guitarist Stuart McCallum; jazz collaborators Ben Waghorn and Laura Jurd provide improvisational flair; and strings enhance the cinemascopic fervour whilst also providing contrasting tranquillity. Dionne Bennett’s intense, often angsty delivery is perfect for this album’s pervading themes of ‘relationships and the human condition’, and her inflected control, vibrato and sumptuous harmonies feel matchless on the current scene. Scintillation, for example, smoulders over searing strings before erupting into darting rhythms and instrumental soloing over tremulant Fender Rhodes, with tensile “I feel your fire” vocals at snapping point; and McCallum’s reverberant electric guitar paints the sky with incandescent white light. Key to the band’s percussive drive is Elliot Bennett, whose intricacy and energy is always so compelling to watch and hear – opener The Fix is typical of his kaleidoscopic approach, combining weighty, held-back lurching with pin-sharp, cymbal-thrashing accuracy. It’s difficult to overstate how slick and how layered this production is. Delusive‘s catchy core riff recalls Harold Faltermeyer’s ‘Axel F’; Dave Stapleton’s introduction of the Moog synth, especially in High Praise and Room with a View, is inspired – evocative of ’70s prog, it adds so much to this tumultuous, energising 21st Century landscape; and Deri Roberts’ sound manipulation in Oblivion, supporting Dionne Bennett’s frenetic, shouted choruses of “Leave me alone” confirm that any one of this album’s nine tracks could be the dramatic backdrop to a blockbuster thriller (and equally at home on BBC 6 Music’s playlists). The transformation of one of Stapleton’s earlier, minimalist, Gorecki-inspired piano works (from his own album Flight) into the soulful vocal outpouring of Unsetting Sun is effective, with string quartet intensifying the heart-wrenched emotion; The Brink is a standout, pulsating, soul/rock episode, with McCallum’s cascading guitar lines enhancing its exciting cacophony; and wind-down end-piece All Things, complete with oscillating synth sirens, wraps up this breathtaking 46-minute visceral explosion. The ‘difficult second album’? Not… a… chance! Released on 4 November 2016, All Things is available as LP, CD and digital download from Edition Records at Bandcamp. THE VOICE that launched… well, a whole new expression of jazz unveils her eponymous debut recording with Slovenian accordionist/vocalist Janez Dovč and Brazilian-born percussionist/vocalist Adriano Adewale – ELDA trio. Over the last few years, award-winning Swedish singer Emilia Mårtensson has graced a number of fine recordings, such as those of Kairos 4tet (including Everything We Hold) and her own solo albums (the most recent, Ana). Based in London, she is unsurprisingly in demand for various jazz and cross-genre projects, the dexterity, warmth and Anglo-Swedish clarity of her voice so fascinatingly distinctive and desirable. Mårtensson explains that the concept of providing a confluence for their own cultural and musical experiences was an exciting prospect for the trio – the idea of creating, through the folk music/tales of their three countries of origin, a space to develop and express new compositions with differently-timbred voices, traditional instruments and electronics. From the resultant twelve tracks – mixed, mastered and produced with the reputable expertise of Alex Killpartrick and Chris Hyson – unfolds an atmospheric, enchanting thread of emotion, longing and joy which feels as peerless as it is beautiful. Much of the album was conceived by Mårtensson in Izola, on the coast of Slovenia; so it’s greatly inspired by the sea, especially her grandparents’ story of how they moved from Slovenia to Sweden (and her empathy with accordion music stems from the impression made on her by her grandfather’s talent for the instrument). So a strong element of adventure and journeying is evident both in Mårtensson’s sincere delivery of her poetic lyrics (“I’ll always remember when the moon fell asleep behind the hill”) and in the chameleonic chordal and percussive invention which Dovč and Adewale supply – and that sense of the unknown, throughout, holds the attention. Dusky memories in Stone Agaton are emphasised by Adewale’s deep chantings, accompanied by earthy percussion; and songwriter Jamie Doe’s positive, accordion-pulsed love ode, Winter, appears to sneer at the darkest season (“So put on all your jumpers and scream around the house”). Homely, descending chromatics, along with Mårtensson’s warm, high tones, are a joy in Barnaby Keen’s The Air Holds a Memory, whilst the contrasting themes of exile in Aleksandrinke touch the heart, emphasised by the watery swell of udu; and tranquil, overlaid vocals alone in To the Sun, To the Moon evoke cool, clear skies above silhouetted forests. Rhythmic Mårtensson/Dovč composition Hon Och Han might suggest it has long been rooted in tradition (redolent of, say, Trio Mediæval’s output), even with an anthemic, Coldplay-like chorus; and following, sustained by bass synth, the vocals of Dovč’s slow, mysterious The Tree cry upwards to the moon. Quirky hoots, squeaks and clangs in Jac Jones’ Ellis Dreams are interspersed with a blithe vocal/synth melody; and the hollow, echoic interpretation of Swedish folk song Remembering/Vem Kan Segla further confirms Mårtensson’s clear communication with Dovč’s sensitive accordion phrasing. A mesmerising solo from Adewale – I am dreaming with you – is quietly disconcerting, with shouts and percussive rattles three-dimensionally coming in and out of range through the darkness; the Konnakol introduction of Dovč’s Tillsammans curiously evolves into a hint of melodic, swingin’ Sixties; and Adewale’s trio curtain-call, Lobo Guara, fizzes with joie de vivre (Emilia perhaps overdoing it on the punsch!). Catalogue it in ‘jazz’, ‘folk’ or ‘world’… wherever, ELDA trio is a beautiful experience. Released on Two Rivers Records, on 23 September 2016, and available from Bandcamp. IT MAY BE CLICHÉD to describe an album as a ‘musical journey’, yet the progression in Let’s Dance very much suggests passage through the kind of open, atmospheric Scandinavian landscape portrayed on the cover of this new release from Norwegian drummer and multi-instrumentalist Per Oddvar Johansen. Although it marks his debut as leader – with longstanding colleagues Helge Lien (piano) and Torben Snekkestad (saxophones, reed trumpet) – Johansen’s established recording career has seen him appear on over eighty albums (ECM, ACT, etc. ), collaborating with names such as Adam Baldych, Trygve Seim and Solveig Slettahjell, and collecting six Spellemannprisen (Norwegian Grammys). This trio’s sound palette is many-hued, whilst maintaining a thread of serene majesty, as in opening title track Let’s Dance – a gentle, misty, Tord Gustavsen-like dawn with an arcing sunrise melody painted by Torben Snekkestad’s wispy, duduk-toned soprano sax. As a drummer, percussionist and composer, Johansen also has other instrumental capabilities up his sleeve on this recording (violins, vibes, guitars, etc. ), yet the structural balance of these nine tracks is never in doubt. Forest Flower‘s atmospheric delicacy – with distorted reeds, low-sustained piano strings and fragile percussion respectively evoking bird calls, looming storms and the gradual onset of rainfall – is so beautifully imagined. Flying extends the themes of natural openness and shifting climatic conditions through the spacial rise and fall of electronics, violin and dewdrop vibraphone; and the lyrical, folksong qualities in No. 7 feel reminiscent of the work of Jonas Knutsson. Helge Lien’s restrained yet exploratory piano style is central to many of these pieces, his authoritative sense of equilibrium shining through in Panorama, a dark, brooding episode suspended by his deeply-plumbed pedal notes and only occasional glimmers of brightness; and Per Oddvar’s brushed subtleties underpin Snekkestad’s lachrymose improvisations with incantational foreboding. In contrast, the lurching slide-guitar folksiness of Uluru (for Anette) suggests arrival at a woodland clearing, complete with the sound of lofty tweets and distant, flowing streams – one of a pair of delightful miniatures (with free, electro-percussive Impromptu) which perpetuate the pervading themes of free-roaming expedition. The rubato of Families, over a slowly oscillating bass figure, offers both Snekkestad and Johansen a broad canvas to explore, with Lien’s own, single-line piano excursions finely placed; and closing track Song M is coloured by the beautifully richness of tenor sax amidst the tranquillity of brushed snare/cymbals and nebulous piano. Recorded deep within the forests of Sweden, the tranquillity of Per Oddvar Johansen’s Let’s Dance may be interpreted as a grateful invocation to nature – and it’s not difficult, on close examination, to fall under its spell. Watch the video of the recording of the title track here. Released on 25 March 2016, the album can be purchased from Edition Records’ Bandcamp store. THE PRACTICE of extracting music from one context and artfully adapting it for another has long been a fascination. Church organists, for example, can be such masters of disguise, relishing the opportunity to befuddle their listeners with, normally, the most incongruous of selections. 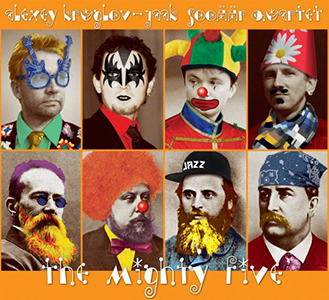 So, this quartet release of sparky arrangements and improvisations by Alexey Kruglov (saxophones) and Jaak Sooäär (electric guitar), based on celebrated Russian classical masterpieces, instantly grabbed the attention. Saxophonist Alexey Kruglov is a rising, creative star on the Russian and international jazz scene (his 2014 ACT Music release, Moscow, with renowned German pianist Joachim Kühn, of particular note) and Estonian guitarist Jaak Soäär has, for many years, featured prominently in the pop and jazz culture of his homeland. Joining them are seasoned jazz musicians Mihkel Mälgand (bass) and Tanel Ruben (drums). In a programme of Mussorgsky, Rimsky-Korsakov, Borodin and Balakirev (the quartet sometimes include Cezar Cui – hence The Mighty Five), the players somehow retain the integrity of these familiar works whilst shifting them into an altogether different sphere – in turns, beautifully lyrical and punkily brazen. Yet, no matter how far they push the envelope, there is clearly a fundamental, underlying respect for and adherence to the originals. The orchestral majesty of the first movement of Rimsky-Korsakov’s Scheherazade (The Sea and Sinbad’s Ship) is, here, transformed by Kruglov’s alto into a luxurious, TV-theme-like sweep, with Sooäär’s guitar encouraging more energetic, improvised development – an altogether brilliant re-working. Polovtsian Dance (otherwise known as the Chorus of Polovtsian Girls from Borodin’s opera Prince Igor) is powered-up by crunchy rhythm guitar, its irregular metre paving the way for gutsy extemporisations. The first of the quartet’s interpretations from Mussorgsky’s Pictures at an Exhibition – The Old Castle – possesses a fine, bluesy swagger, thanks to the pliant double bass of Mihkel Mägland, Kruglov’s hard sax tone and Sooäär’s high-fretted wails; and, audaciously and raucously, Rimsky-Korsakov’s The Flight of the Bumblebee is compressed into 75 seconds of intense pleasure, its wild, frenetic, group activity bordering on free jazz. Mussorgsky’s stately The Great Gate of Kiev is fabulously fashioned with solid drumming, eloquent electric bass improv and the irrepressible scribbles and scrawls of Kruglov’s alto; then a Balakirev piano Nocturne is elegantly reimagined for jazz quartet, amidst hints of restlessness. Mussorgsky’s Baba-Yaga is well suited to the anarchic romp created here, including some wonderfully chattering soprano against a fast electric bass undercurrent, and Sooäär’s imaginative guitar/electronics are superb – a stand-out track, in fact. To close, Prince Igor’s Aria (Borodin’s emotive No Sleep, No Rest from Prince Igor) is sympathetically realised as extended chamber jazz, its many facets reflecting the shared invention throughout this extraordinary, rather special album.